St.Botanica Pure Hyaluronic Acid Professional Facial Serum with Vitamin C & Vitamin E offers effective hydration and anti-aging benefits. It heals dryness on face with intense hydration. The skin plumping properties help reduce fine lines and wrinkles. It helps give a brighter complexion. Lightens dark under eye circles and puffiness. It is 100% pure and stable hyaluronic acid at the highest concentration, to ensure its fullest potential with maximum results. Hyaluronic acid effectively binds water to cells and is responsible for the elasticity and resiliency of the skin. Such properties make hyaluronic acid serum effective in transforming skin to promote a healthy and balanced glow. Protect your skin from free radicals, sun exposure, and environmental stresses by nourishing it with powerful antioxidants like Vitamin C & Vitamin E. It delivers a youthful & more vibrant appearance to your face. Explore the entire range of Serums & Essence available on Nykaa. 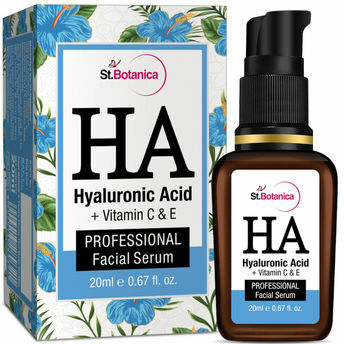 Shop more St.Botanica products here.You can browse through the complete world of St.Botanica Serums & Essence .